Pictured is JoLeigh Young showing the award-winning design she created for the River Sweep Poster Contest. 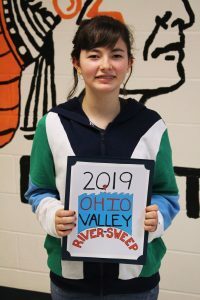 Moundsville Middle School 8th grader JoLeigh Young was named the overall winner in the Ohio River Sweep Poster Contest T-Shirt division. She will receive a $500 prize for winning the category. Her design will appear on all 2019 Ohio River Sweep t-shirts. More than 1,500 posters were submitted to the Ohio River Valley Water Sanitation Commission (ORSANCO) sponsored contest. Young competed against students from Illinois, Indiana, Kentucky, Ohio, Pennsylvania, Virginia, and West Virginia. The Ohio River Sweep is a riverbank clean up held along the Ohio River and its major tributaries. The annual event will be held on Saturday, June 15, 2018. In Moundsville, the Ohio River Sweep is held at Riverfront Park on 13th Street. For more information about the local Ohio River Sweep or to sign up as a volunteer, please contact Jeff Palmer at 304-639-7532.